Zalakdozi is originally a hook embroidery, named after a hook that resembles a crochet hook. It is one of the forms of Kashmir embroidery (also known as Kashida). Zalakdozi (chain) is one of the stitches invoved in kashida. 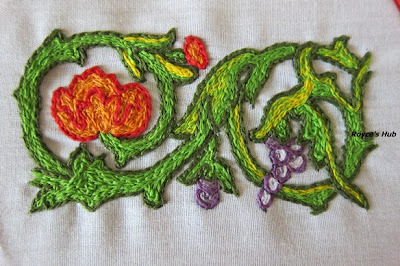 Other stitches udes in Kashida are Sozni (satin), Vata chikan (button hole), and occasionally, Herringbone, doria (openwork) and talaibar ( goldowrk ) are used. Various articles are made by zalakdozi like, bags, foot wears, cushion covers, curtains, bed spreads, table mats, dress materials etc. 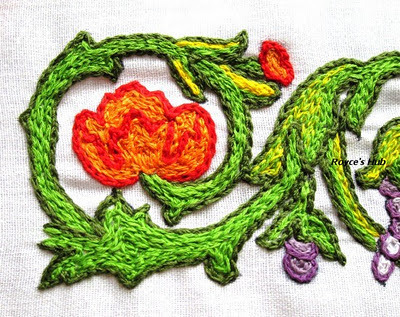 In zalakdozi , chain stitch is used to fill areas or motifs . The motifs are outlined in one color and filled with different shade of the same color to give it a distinct appearance. The main motifs used are : Paisley , maple leaf ( chinar), flowers ( lotus, lily, Iris , Saffron, Tulips ), Fruits ( grapes, apples , almonds), Birds ( parrot, woodpeckers and kingfishers), animals and human figures. 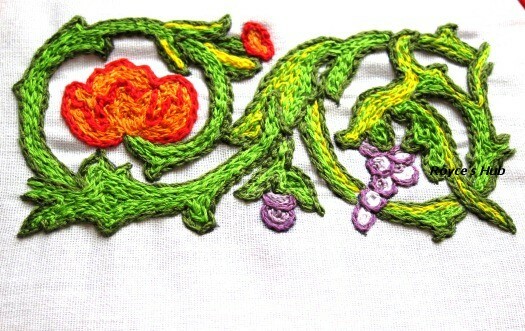 This is a grape vine design worked in Zalakdozi (I have used needle and not the hook). Its entirely worked in parallel/ concentric rows of chain stitch. First, the design is outlined using chain stitch and then filled in using chain stitch and a different shade. You can notice Shading that I have done using chain stitch. The left side vine and leaves around the flower are worked using three strands of green and yellow color threads each separately, where as, on the right side , the leaves and vine have been worked with two strands of green and one strand of yellow thread held together , giving the shaded appearance. I like this zalakdosi. It is a very special type of shading. Hi Dear, I know this technique & i have done some cushions with the same techniques :) this is called Zardosi here too ! !